Chronic periaortitis (CP) is a rare condition, hallmarked by periaortic fibro-inflammatory tissue which often causes ureteral obstruction, and encompasses idiopathic retroperitoneal fibrosis and inflammatory abdominal aortic aneurysm (IAAA). CP usually responds to glucocorticoids, but some patients may be steroid-refractory or not tolerate standard glucocorticoid doses. For such cases, valid therapeutic alternatives are lacking.1 2 Combinations of prednisone and immunosuppressants (eg, cyclophosphamide, mycophenolate mofetil) are not of proven superiority to prednisone alone, and their effectiveness in refractory CP is unknown.3 4 Because B cells abundantly infiltrate CP lesions,5 and CP is often associated with autoimmune diseases,6 we used rituximab in two patients with CP, one refractory to conventional treatments, and the other with contraindications to standard-dose glucocorticoids. Our first patient, a 49-year-old woman, was hospitalised for malaise and back pain. Abdominal CT revealed a soft-tissue-density periaortic mass suggesting CP, a diagnosis confirmed by laparoscopic biopsy (figure 1). The patient responded to prednisone (initial dose, 1 mg/kg/day), with symptom remission and reduction in CP thickness, but relapsed with back pain and CP enlargement when the prednisone dose was 5 mg/day (8 months after treatment initiation). Further treatment with prednisone (initial dose 0.8 mg/kg/day) plus methotrexate (0.25 mg/week) for 11 months, and subsequently tamoxifen, failed to induce remission. At restaging 24 months after disease onset, erythrocyte sedimentation rate (ESR) and C-reactive protein (CRP) were 64 mm/h and 6 mg/l, respectively, antinuclear antibodies (ANAs)were 1/160, and IgG4 was 15 mg/dl (normal <135). Positron emission tomography (PET)/CT showed increased periaortic [18F]fluorodeoxyglucose (FDG) uptake (maximum standardised uptake value (SUVmax) 8.7)(figure 2A–C). We felt rituximab was a reasonable option, thus administered one dose of 375 mg/m2 a week for four consecutive weeks without any additional therapy; pain improved, and ESR and CRP normalised. Three months later, the [18F]FDG uptake on PET-CT had almost disappeared (SUVmax 2.6) (figure 2D–F). Eighteen months after the start of rituximab treatment, the patient is off-therapy and still in remission. Histopathological and immunohistochemical analysis of the retroperitoneal biopsy specimen in the first patient. (A) The retroperitoneal tissue specimen is characterised by a dense fibrous tissue with a mild-to-moderate amount of spindled fibroblasts/myofibroblasts and a chronic inflammatory component mainly made up of lymphocytes and plasma cells organised in diffuse (asterisk) and pseudo-follicular (arrow) patterns. 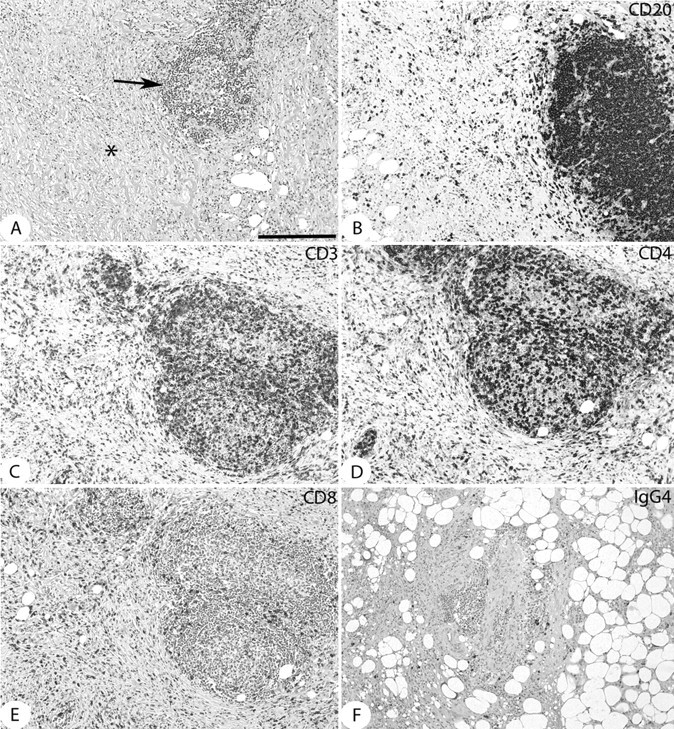 The lymphocytic inflammatory infiltrate is composed of CD20 cells (B) that are predominantly situated in the pseudo-follicular aggregates, and CD3 lymphocytes (C) that are distributed both diffusely and within the aggregates. The CD3 lymphocytic subset is mainly composed of CD4+ elements (D), while CD8 cells (E) constitute only a minor fraction. (F) There is a mild infiltration of IgG4 plasma cells throughout the fibro-inflammatory proliferation. Staining: (A) H&E; (B–F) 3,3-diaminobenzidine-revealed immunohistochemistry mildly counterstained by Harris haematoxylin. Original magnification: ×10. Bar scale: 300 μm. [18F]Fluorodeoxyglucose (FDG) positron emission tomography (PET)-CT evidence of response to rituximab in the first patient. (A), (B) and (C) respectively show CT, PET and PET-CT evidence of active chronic periaortitis. A periaortic cuff, recognisable in (A) (arrow), is the site of marked accumulation of [18F]FDG, as seen in (B) and (C) (arrows). (D–F) show the evolution of the disease 3 months after rituximab therapy: mass shrinkage (D, arrow) is accompanied by the almost complete disappearance of [18F]FDG uptake in the periaortic area (E and F, arrows). Our second patient, an 81-year-old man with dyslipidaemia, obesity, hypertension and a history of myocardial infarction, was hospitalised for abdominal pain and constipation. Five months earlier, he had undergone endovascular repair of an IAAA. On his admission, his creatinine was 1.9 mg/dl, ESR 86 mm/h, CRP 90 mg/l, ANAs 1/160, and IgG4 59 mg/dl. CT disclosed further CP progression, with bilateral hydro-ureteronephrosis; PET-CT revealed a high periaortic [18F]FDG uptake (SUVmax 8.1). Bilateral ureteral stent placement achieved renal function normalisation. Considering the patient's high cardiovascular risk, we decided to use low-dose prednisone (25 mg/day, tapered to 5 mg/day over 5 months) plus rituximab (one dose of 375 mg/m2 a week for four consecutive weeks). Pain and malaise disappeared and inflammatory markers normalised. After 3 months of treatment, CT showed CP shrinkage, and PET-CT a decreased [18F]FDG uptake (SUVmax 3.0). The ureteral stents were removed, and 7 months later the patient is asymptomatic, with no evidence of hydronephrosis. We have here described two patients with CP treated with rituximab; the first failed to respond to different therapies, while rituximab alone induced sustained disease remission. The second received rituximab plus low-dose prednisone because standard-dose glucocorticoids were contraindicated; although prednisone might have induced remission by itself, the dose we used is generally insufficient for CP.4 7 Importantly, rituximab was well tolerated and safe in both patients. In a recent report, one patient with periaortitis secondary to IgG4-related systemic disease was successfully treated with rituximab, although the response of the retroperitoneal mass was not described.8 Rituximab is increasingly used in different autoimmune disorders such as rheumatoid arthritis, systemic lupus erythematosus and anti-neutrophil cytoplasmic antibody (ANCA)-associated vasculitides.9 CP is also thought to have an autoimmune background, given its association with autoimmune diseases6 10 and with the autoimmunity-predisposing HLA-DRB1*03 allele.11 The efficacy of rituximab also suggests a crucial pathogenetic role for B cells in CP. B cells are abundant in CP tissue, where they form the core of the inflammatory aggregates, but their mechanisms of action are still unclear. In conclusion, rituximab may be effective in CP. Larger studies are warranted to better appreciate the efficacy and safety of this approach and to select candidate patients.
. Chronic periaortitis: a fibro-inflammatory disorder. Best Pract Res Clin Rheumatol 2009;23:339–53.
. The spectrum of chronic periaortitis. Histopathology 1990;16:423–31.
. Cyclophosphamide is a highly effective and safe induction therapy in chronic periaortitis: a long-term follow-up of 35 patients with chronic periaortitis. Ann Rheum Dis 2012;71:311–12.
. Combined prednisone and mycophenolate mofetil treatment for retroperitoneal fibrosis: a case series. Ann Intern Med 2011;154:31–6.
. Idiopathic retroperitoneal fibrosis: clinicopathologic features and differential diagnosis. Kidney Int 2007;72:742–53.
. ANCA-positive periaortic vasculitis: does it fall within the spectrum of vasculitis? J Intern Med 2002;251:268–71.
. Prednisone versus tamoxifen in patients with idiopathic retroperitoneal fibrosis: an open-label randomised controlled trial. Lancet 2011;378:338–46.
. Evidence of follicular T-cell implication in a case of IgG4-related systemic disease with interstitial nephritis. Nephrol Dial Transplant 2011;26:2047–50.
. Rituximab versus cyclophosphamide in ANCA-associated renal vasculitis. N Engl J Med 2010;363:211–20.
. Peripheral inflammatory arthritis in patients with chronic periaortitis: report of five cases and review of the literature. Rheumatology (Oxford) 2008;47:315–18.
. Chronic periaortitis and HLA-DRB1*03: another clue to an autoimmune origin. Arthritis Rheum 2006;55:126–30.